A update on the appeal total can be found here. A late call for this Gala, which is running over the next two days. The TPO set is in operation on both days with exchanges at 2:47pm each day. The NatWest Community Force voting is into it's final 4 days before voting closes at lunchtime on Monday 24th. The Mountsorrel Railway Project has led the voting by a good margin since day one almost four weeks ago, but one of the other groups has come from nowhere to be only 14 votes behind us. It would be sole destroying for the project to have this £6000 grant snatched away from us at the last minute. Please can I ask you to spare a couple of minutes to vote for us by following the instructions below. More importantly, please can I also ask that you forward a request for votes to the people in your address book, we need them to vote as well. Thank you very much. Your vote and the votes of your friends really will make all the difference. Please vote by following the instructions below, especially if you've tried to vote beforehand and had problems with the process. NatWest have devised a voting process that ensures fairness by asking voters to register their email address first. If you have been trying to vote for us but without success please follow these simply instructions. Please note that at times the NatWest website can be very slow. Do be patient. You will receive a confirmation email with a link you have to click on to confirm your registration. Click on the check box to confirm the terms and conditions and then vote for us. Please make sure the vote count goes up by one to ensure your vote has been counted. The prize money would go towards the £25,000 currently being raised for rail and sleepers to extend the branch to almost a mile long, nearly all the way to Mountsorrel. Winning the £6,000 would make a huge contribution. But we need as many people as possible to vote for us, so please don’t wait, and place your vote now! And please get as many friends and family to also vote for our project. Thank you. 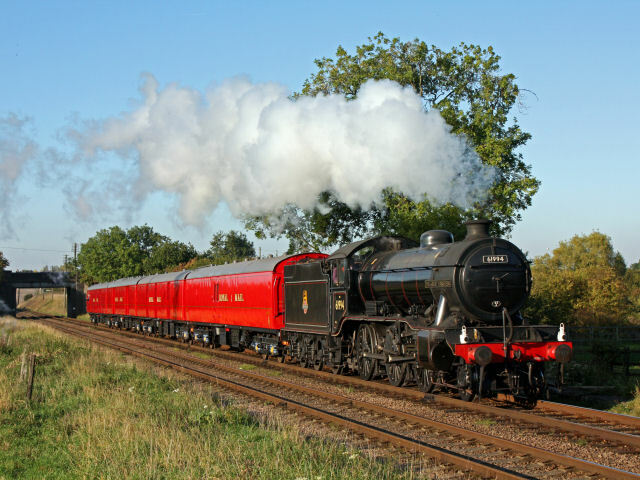 The next big gala RVP is involved in on the GCR will be the Autumn Gala October 6th-9th. As usual we will have the sales stand in Quorn yard along with the BZ and hopefilly the LNER TPO. I would like to extend this to include a memorabilia sale. I have quite a few items to dispose of and will be giving a good donation to RVP from all the items sold. Now for the big question have any of you out there got memorabilia you no longer have use for, just want to get rid of or are down sizing your collection and would like to donate all or part of the proceeds to RVP? If so could you please let me have a short description and the price you would expect so as I can add it to a mailing list. This list will be e-mailed to people who see the advert in Outlook, on our web site or local advertising sites. If I have your permission I may barter on the day of sale. I will let you know the final price achieved and you can decide how much to donate. Please remember that donations should be gift aided this lets the government give us the going rate of tax on top of the donation. I would be grateful if you could arrange to leave any such items at Rothley shed ensuring you give them to one of our members, deliver on the day at Quorn or if fairly local I can pick them up. If this is a success and stock levels are high enough may be we could repeat this type of sale say at two big galas a year. Thinking of stock levels if anyone out there has railway items such as books, cd’s ETC. That could be donated to the general sales stand please feel free to drop them off on the day or at Rothley shed any other time. Also any help on the days of the gala would be very welcome. LNER TTO, 23981, which is next in line for restoration to its former glory of varnished teak, has now been moved from Swithland sidings to Rothley carriage works for inspection. It is hoped to be able to display the vehicle at the forthcoming Steam Railway Gala in October to enable the public to compare this vehicle with the restored LNER buffet. Donations are most welcome towards the restoration of this vehicle and details can be found found here. A new way of donating to the appeal can be found here. Update on the fund raising for Gresley LNER TTO 23981 can be found here. RVP now has a page on facebook. 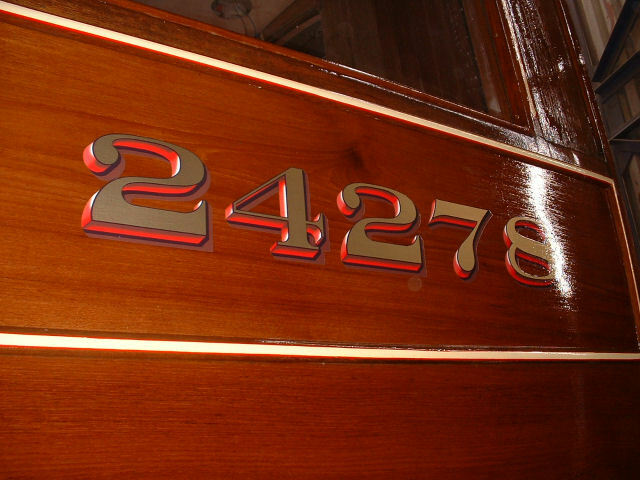 LNER buffet car, 24278, is set to be launched into traffic this weekend at the “Mail by Rail” gala, carrying passengers for the first time since the early 1970s. The image on the left shows the vehicle at Loughborough on Friday 22nd July ready for service. RVP’s Beavertail, 1719, will complete its vist to the Mid Norfolk Railway shortly. 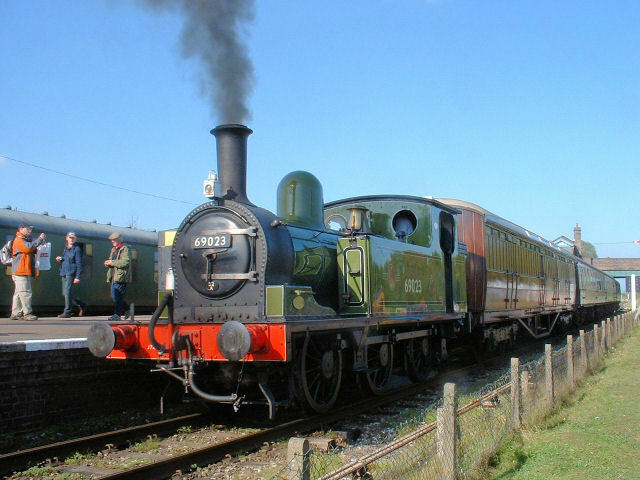 Its last operating dates are the 16th & 17th July at the Mid Norfolk Railway's first Steam Gala. 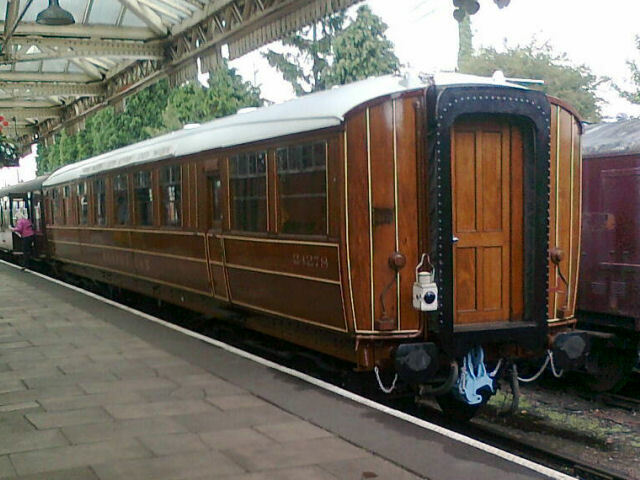 Following on from this, the coach will move onto the North Norfolk Railway for a visit that will last until the middle of September. LNER BGP 4050 has been withdrawn from service for a body overhaul and repairs. This will include a new roof canvas, internal repaint, striping and re-vanishing the body panels and repairs to hand brake and bogies. Buffet 24278 has been lifted for completion of underframe work and setting of bogies. The vehicle should enter traffic at the Mail by Rail Gala on 23rd & 24th July. 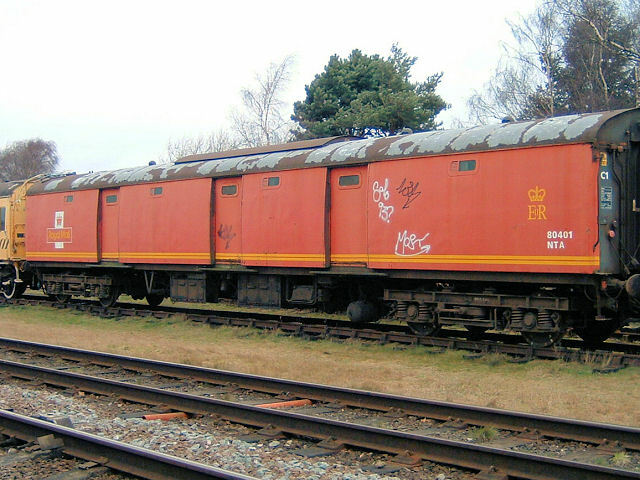 Mark 1 TPO Tender, 80401, has been lifted and the bogie, bolster and buffer heights set. The dual brake conversion has been completed and tested in Vacuum and Air brake modes. Work continues to make the vehicle usable for the Mail by Rail Gala. Beavertail 1719 landed at Dereham on the Mid Norfolk Railway at 10am 3rd June. It was quickly serviced and cleaned ready for a test run that evening behind blue painted King class locomotive number 6023. Scheduled to run on weekends 4/5th June, 11/12th June, 9/10th July and 16/17th July. RVP’s Beavertail, 1719, is in demand. Following on from last years trips to the Battlefield Railway and the Churnet Valley Railway 1719 is now set to visit the Mid Norfolk Railway for a short period. It will be in service on the MNR on the following dates: 4th, 5th, 11th and 12th June, and 9th, 10th, 16th and 17th July. Further operating dates will be announced in due course. Full details can be found on the MNR website. 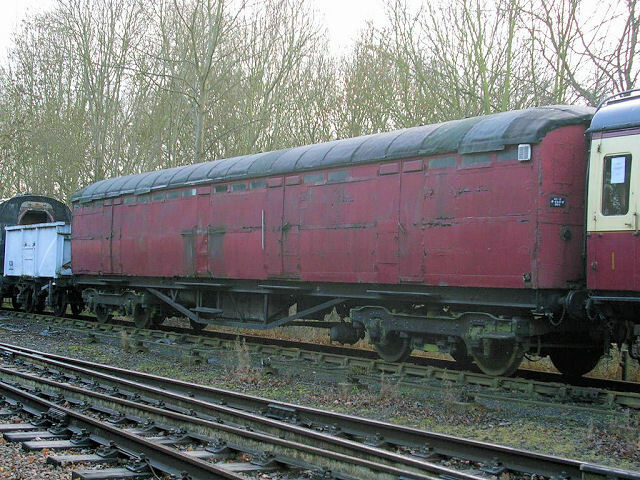 With the restoration of Gresley LNER RB 24278 nearing completion an appeal has now been launched for the next restoration project, this being LNER TTO 23981. Details can be found here. The first train since the 1950's has now run over the Mountsorrel Railway. More details on this project can be found on the Mountsorrel Railway website. 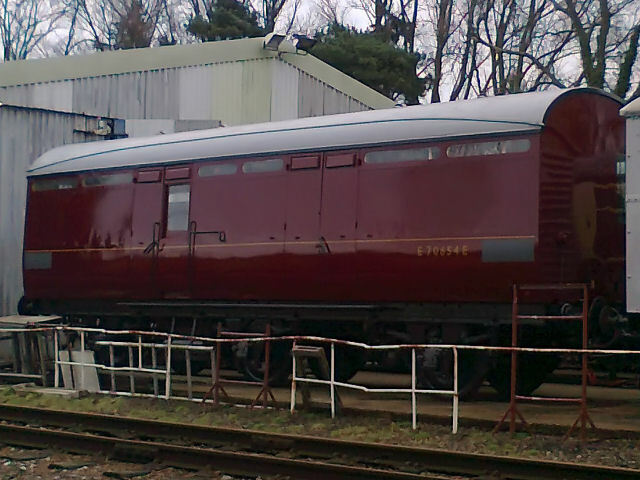 BZ E70654E has now been outshopped from Rothley after its overhaul and repaint into maroon livery. TPO Running Dates - The 1V86 TPO set will be running again on the following days: 26 & 27th March - 1960's Gala, 9th & 10th April - Mini Steam Gala. The number of runs each day & times have yet to be confirmed. The latest arrival at the GCR is another Mark 1 TPO in the shape of POT 80401, which was one of the earliest BR Mark 1 TPOs built in 1959 for the stowage of mail bags. 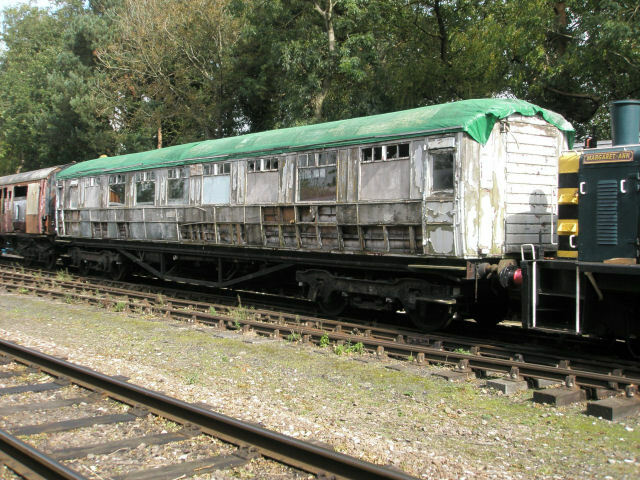 This vehicle, which has arrived from the Gloucester and Warwickshire Railway, is now owned by a member of RVP. BZ E70654E has now had its roof vents and rainstrips installed followed by painting of the roof. 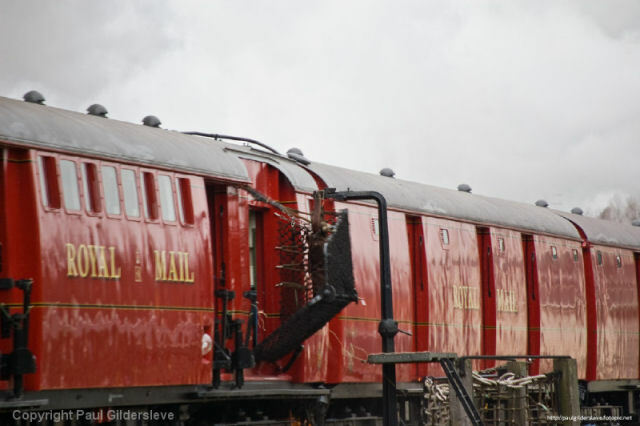 The recent GCR Winter Gala saw the TPO set operate three exchanges each day. This image and the one that follows were taken by Paul Gildersleve on the Saturday and show 45305 working the 12.08 TPO from Loughborough. More of Paul's photographs can be found on his fotopic website. The moment of impact. The pouch is about to be knocked from lineside standard into the carriage net, which will then fall into the coach. 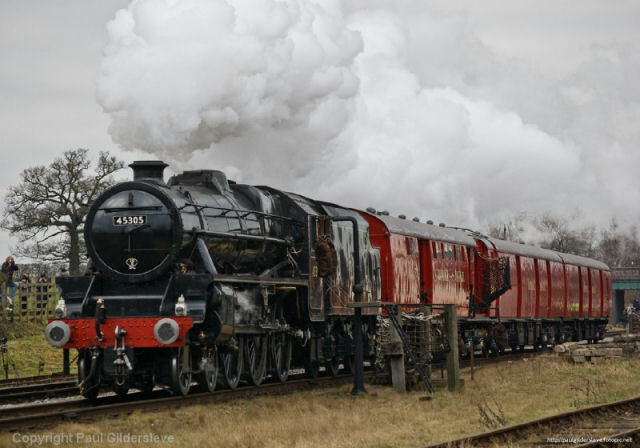 GCR WINTER GALA 29th & 30th JAN - Update. We have been advised of some changes to the TPO exchanges at the gala, there are now three exchanges each day and a change to the loco lineup as a result. Locos (provisional) will be 3717 "City Of Truro" on the 10.33 each day, the 12.08 will be 45305 on Saturday and 30777 "Sir Lamiel" on Sunday, 61994 "The Great Marquess" will haul the 4.33 each day. GCR WINTER GALA 29th & 30th JAN - The GCR winter gala, with a Banbury theme. As usual the TPO set will be out; mail drops will take place at Quorn and at present will use GWR 3717 City of Truro and GWR 3850 each day. The BEAVERTAIL will also be in use - supplement payable. The LNER TPO set will also be on display at Quorn. A revised standing order form is now available for those who like to make a regular donation to RVP. Note: Those who make a regular donation of at least £2 a month automatically enjoy becoming a member of RVP. BZ E70654E was having the guttering installed along the cant rail, as well as the holes being cut in the roof for the roof vents. RB 24278 saw a team of people working on the corridor side of the buffet car. Other work was being undertaken by RVP on the GCR’s Mark 1 stock including the rebuilding of some B4 bogies. Repairs to the roof of this vehicle are now nearly complete. 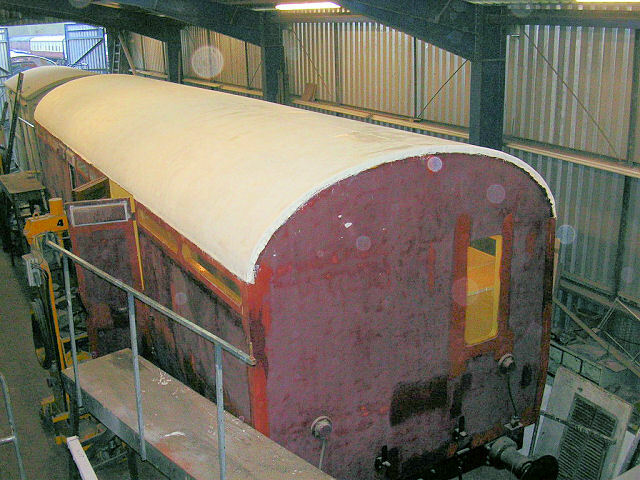 Several sections of the roof planking has been replacement, with the roof then being sanded smooth and painted before a new roof canvas was applied, the canvas then being painted. 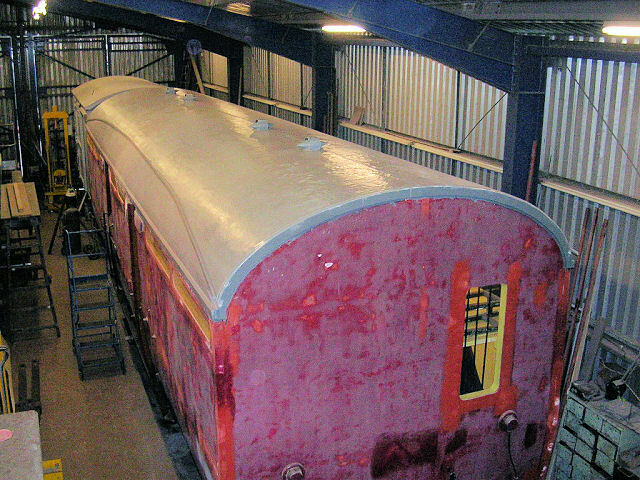 The image here shows the current state of the roof on 13th December 2010 and is awaiting a coat of grey paint so that it matches with the LNER TPO set. The painting of the body will follow shortly. This vehicle, which was acquired during 2010, is seen at Rothley and has during the last few months seen the replacement of the vacuum pipework. Work on this vehicle is moving on swiftly, as this picture shows. The lettering has now been applied along with more coats of varnish. Internally work continues. Roof destination boards have now been completed and just wait to be taken to Rothley for fitting to the carriage. The AGM of RVP took place on the 27th November 2010 at the GCR’s Lovatt House in Loughborough. During the AGM Dorothy Green formally stood down as RVP’s President having held the position for a number of years. Darren Martin, a former Chairman of RVP, was appointed as the new President. The AGM also formally approved the election of Paul Harrison to the Board. This vehicle has been a wondering ambassador for RVP this year. 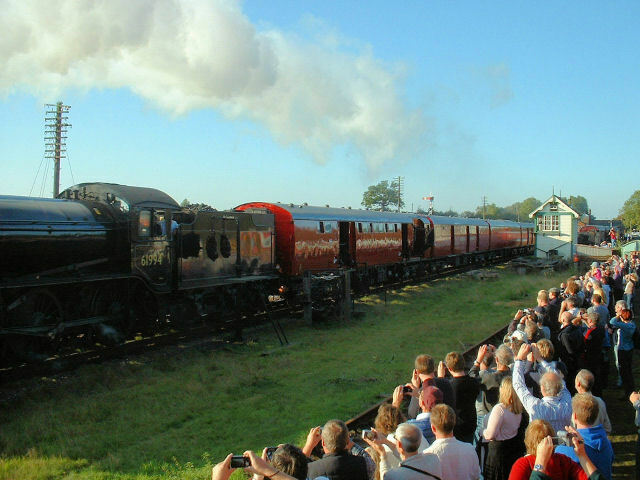 Having completed its summer visit to the Battlefield Railway it returned to take part in the “Steam Railway” gala before going on loan to the Churnet Valley Railway for three galas in November. The image on the left sees E1719E at Froghall on 13th November 2010. The "Steam Railway" Gala in October saw the Mark 1 TPO set in action, with a total of five exchanges taking place over the weekend. The appearance of 71000 "Duke of Gloucester" on the Saturday night run is one that will be remembered for some time to come. This picture, taken by Paul Biggs, shows 61994 "The Great Marquess" hauling the 16:20 TPO from Loughborough on Sunday 10/10/10 at Woodhouse and clearly demonstrates the stunning sight that the TPO set in the early Royal Mail Red livery now makes. 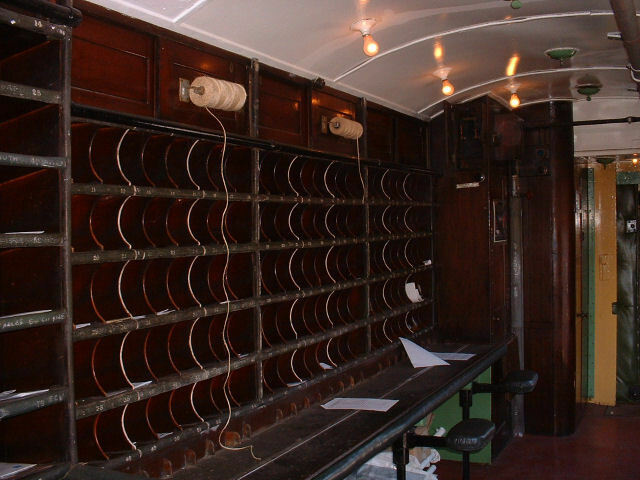 The same train on the same date is seen about to exchange the mail and also demonstrates how popular this feature is with the visiting public. 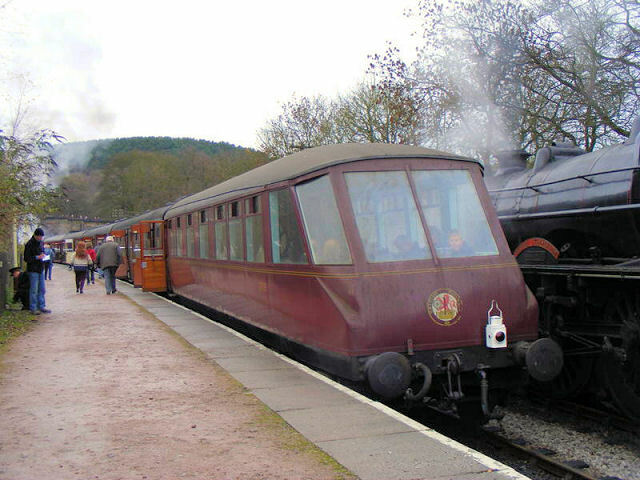 Another vehicle from the RVP collection that saw use at the Gala was LNER BGP 4050, which was used on the local stopping train. Here it is seen directly behind LNER designed J72, 69023. On display at Quorn & Woodhouse was the LNER TPO set that allowed that public to have a look inside the TPO set.